ZoomPanel Reviews - Legit or Scam? ZoomPanel Reviews – Legit or Scam? ZoomPanel, at www.ZoomPanel.com, is one of SurveyMonkey’s new paid survey programs that allow you to earn points just for giving your opinions about existing products and testing new products before anyone else. 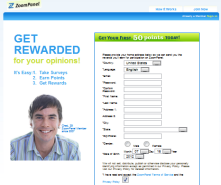 ZoomPanel claims that you can earn up to 250 reward points per survey you successfully complete, and that these points can be rewards for various rewards like music, electronics, online gift cards, and more. It is free to sign up to take surveys through ZoomPanel, but you must provide all your contact information, including mailing address and email address. This information must be accurate in order to ensure your rewards successfully get to you. As you successfully complete surveys and product panels, you will be awarded a certain number of points depending on the project. As you accumulate points, you will be able to visit the reward center and how many points you will need to earn certain rewards. You can search the rewards either by number of points that you have collected, or through the category of prize that you are interested in potentially finding a prize. These categories include items from Home & Garden to Health & Beauty to Accessories to Electronics. Once you choose the prize you’d like to receive, simply click the Redeem Points button below the prize description and then click Confirm. Once you confirm your order, it will take 4-6 weeks for your prize to be delivered to you, unless you order a virtual gift card. Those will be emailed to you within 48 hours. As long as your account remains active with ZoomPanel, you can maintain your points, even if you take a break from actually completing surveys. In order to keep an active account, you must sign in at least once a month. If your account is inactive for 3 months, it will be deactivated and your points will be lost. Also, if you do decide to participate in any of the product panels, make sure that you understand the rules of the panel. Often times you’ll be given a product to try, but if you do not return it in a certain time period, you’ll be charged. Finally, as with all paid survey opportunities, it is always best to sign up with a variety of legitimate companies so that you can maximize the number of surveys you are receiving. You will not qualify for every survey that is sent to you, and you will not always be sent surveys, so it’s best to have many options. Average Rating for " Zoompanel Legit " is 2 out of 5 based on 9 reviews. I was a member for a while & had 15,000 points. I can no longer access their site. I read they were acquired by SurveyMonkey & One Opinion. Which one is it? It says the points will be transferred to the new survey company& I want to make sure that it is. I have been a member for over 5 yrs now and haven't had any problems. I prefer the Amazon gift cards as you can buy anything with them online as opposed to preselected items that seldom interest me. I have redeemed points for four 25 dollar gift cards to date and received them within ten -fourteen days with no problems. As one other reviewer mentioned, my only complaint is the surveys that you spend ten minutes completing only to be told you don't qualify and get 5 points for it. Not all people get their changed reward, which is only a $25 Amazon Gift Card. Go elsewhere. If you only want $25 Amazon Gift Cards, go for Zoom. I have 15,205 points and want to get out. They are ONLY offering $25 Amazon Gift Cards (see below). Trying to get this clarified, they are part of Citrix.com and I may go to FCC I am so livid. Been a member since 2006 when it was Zoomerang, before being bought out, and they offered lots of things. Now no merchandise WHATSOEVER. All that hard work over the years wasted. I am furious. Thanks for participating in our studies. Currently we only offer $25 Amazon gift cards because there is a wider selection of items on their website. Amazon gift cards are physical cards sent by mail that should arrive within four (4) weeks of redemption. You can redeem a gift card by clicking on “My Points”, select “Display Rewards” in your account, and then select the green button. In order to redeem a reward, you must have 2,500 points or more. Please let us know if you need anything else. I have been a Zoom Panel member for many years. Recently I have found that after getting ten minutes worth of answers from me I "Do not qualify." I don't know what they do with the information they have acquired from me. Qualifying questions should be the first order of business. I finally was able to redeem an Amazon gift card in early December. As of today, after sending several Emails, all ignored, I am still waiting for the card. Stay away from Zoom panel surveys. They are unreliable and a waste of your time. I have been waiting a long time to get the 2 Visa cards that I cashed in . Worried this is a bad site and that I will never see my rewards. I have 15,205 points and want to get out. They are ONLY offering $25 Amazon Gift Cards (see below). Trying to get this clarified, they are part of Citrix.com and I may go to FCC I am so livid. Been a member since 2006 when it was Zoomerang, before being bought out, and they offered lots of things. Now basically nothing. Thanks for participating in our studies. --->Currently we only offer $25 Amazon gift cards because there is a wider selection of items on their website.<--- Amazon gift cards are physical cards sent by mail that should arrive within four (4) weeks of redemption. You can redeem a gift card by clicking on “My Points”, select “Display Rewards” in your account, and then select the green button. In order to redeem a reward, you must have 2,500 points or more. Please let us know if you need anything else. Company doesn't respond to emails. I've been waiting 3 months for my Amazon gift cards and still nothing. There are many other good survey sites out there,STAY AWAY from Zoompanel!!! Zoom panel doesn't care about getting delivering your merchandise when you redeem your points. going on two months waiting for my amazon gift card. cant find any way to contact them to see whats going on. Like Richard I've been waiting MONTHS for my Amazon gift cards and still nothing. Only way to contact them is through email and they never respond. STAY AWAY from this company!! !